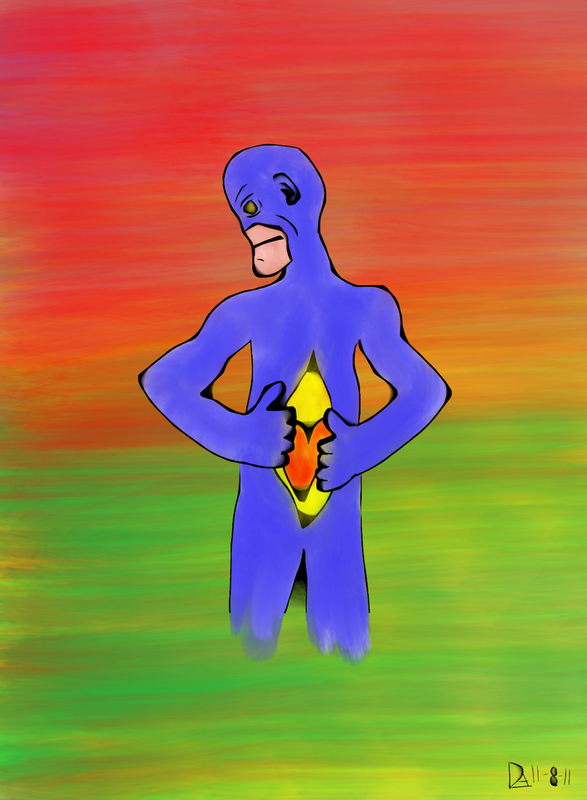 I am an artist and I suffer from Crohn's Disease; a gastrointestinal disorder. This has resulted in six abdominal surgeries, as well as, the removal of my colon and part of my small intestine. The disease has caused a lifetime of pain and suffering. Art has provided me with the tools to transform that pain and anguish into beauty and healing. Line and color provide a conduit through which I can reach into the deepest part of myself and share the treasures that lie within. This has been a war -- the life or death battles, the inability to process emotion while trying to simply survive -- but it is not the war we see on TV, online or in print. It is a much more familiar war, one that takes place in the human heart as we struggle to find meaning and purpose amidst pain, tragedy and loss. This painting is called Opening Up. It represents a moment in time during the process of transformation. The figure in the painting is exposing himself, opening up his wound and finding beauty and treasure where there had once been pain and agony. He is opening himself up now, whereas in the past he had been opened by others. He is still too vulnerable to look at the viewer, so he looks away as he exposes himself. He wears a mask and a full body suit as an added layer of protection, to boost personal power and offset trauma. I was first hospitalized in the mid '70s, around the age of five. It was a horrifying experience; both because of the procedures I went through and because of the way they were handled by the people who performed them. I felt dehumanized during this experience, because I always knew that if they saw me on a human level, at the level of their heart, they would have handled things differently. Instead, they taped me up, tied me down, and shoved a tube down my throat, leaving me defenseless and completely vulnerable. This was the first in a relentless series of traumas, physical and emotional, medical and otherwise, which still haunt me today. Trauma occurs when the amount of emotional energy, which is generated from an event, exceeds the amount that is discharged afterward. As a five year old, I did not know what trauma was or what to do with these feelings. Something inside of me did, though, and it ignited a quest to find a way to process what happened and find peace again. I decided early on that after everything I had gone through and everything I had to deal with on a daily basis, I refused to be unhappy. After all of the pain and suffering, shame, fear and humiliation, insane choices regarding treatment options and the innumerable challenges I faced, I was determined to make it all mean something. Painting is that something. I see feelings as images. Before I started painting, I spent a lot of time trying to explain to people (friends, family, therapists) what I was seeing in order to get them to understand what was happening inside of me. That never worked all that well. Eventually I turned to filmmaking. I received a degree in film from UC Berkeley and won a few awards along the way. Though I still love making films, painting has given me a level of artistic satisfaction I had never experienced before. Several years ago, I experienced a major flare-up of my Crohn's Disease. My doctors couldn't explain what or why this was happening and I knew that this was something beyond their scope of treatment. The symptoms were not unfamiliar: diarrhea, spasming in my throat and stomach, piercing headaches, back pains, nausea and fatigue. I started to sketch to express myself and to be able to show some of the people close to me these visions that I had been trying to describe in words for all of these years. During that time, as difficult and painful as it was, I discovered something wonderful; I drew and I painted and I felt better. Spasms and pain would ease and I was releasing some of the emotional energy that I had held within for so many years. I discovered that I had the ability to portray emotions I had once believed I was all alone with and that people who saw my work, whatever their circumstances, were moved by it. Perhaps most importantly, I could draw and paint for hours on end and I always felt better when I did; I had found my calling.